Attended by: ADMIRAL SIR HEDWORTH MEUX G.C.B. K.C.V.O. Enter the Historic Dockyard by the Victory Gate. 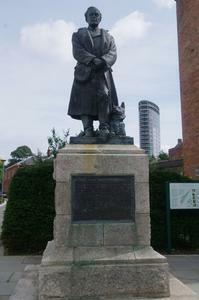 The statue is a few yards down College Road on the right. LIFE SIZE STATUE OF CAPTAIN SCOTT ON PEDESTAL. CAPTAIN ROBERT FALCON SCOTT, R.N., C.V.O., BORN 6TH JUNE, 1868, DIED/ ABOUT 29TH MARCH, 1912, DURING HIS RETURN FROM THE SOUTH POLE. IN/ HIS JOURNAL, FOUND EIGHT MONTHS LATER, HE WROTE" - / THE GALE IS HOWLING ABOUT US; WE ARE WEAK, WRITING IS DIFFICULT,/ BUT FOR MY OWN SAKE I DO NOT REGRET THIS JOURNEY, WHICH HAS SHOWN/ THAT ENGLISHMEN CAN ENDURE HARDSHIPS, HELP ONE ANOTHER, AND MEET/ DEATH WITH AS GREAT A A FORTITUDE AS EVER IN THE PAST. WE TOOK RISKS/ WE KNEW WE TOOK THEM. THINGS HAVE COME OUT AGAINST US, AND THEREFORE/ WE HAVE NO CAUSE FOR COMPLAINT, BUT BOW TO THE WILL OF PROVIDENCE,/ DETERMINED TO DO OUR BEST TO THE END."